Attempting to use up some frozen pumpkin I came across this tasty recipe. Then I made it for a second time the same week. It comes from Taste of Home. I will definitely make it again and again and…..you get the point! I didn’t have custard cups so I used the above dish. I didn’t even cook it in a water bath as the directions said and it still came out good. Next time I may attempt to make it with milk to lighten the calorie load. If I had a milking cow almost all the ingredients would have originated from the farm. I did use duck eggs in this recipe as I am starting to use in all my baked goodies. Not sure exactly what it is about them but they just seem to make things fluffier and tastier. In a large bowl, combine the first six ingredients; beat until smooth. Pour into four greased 10-oz. custard cups. Place in a 13-in. x 9-in. baking pan; pour hot water around cups to a depth of 1 in. Bake, uncovered, at 350° for 20 minutes. 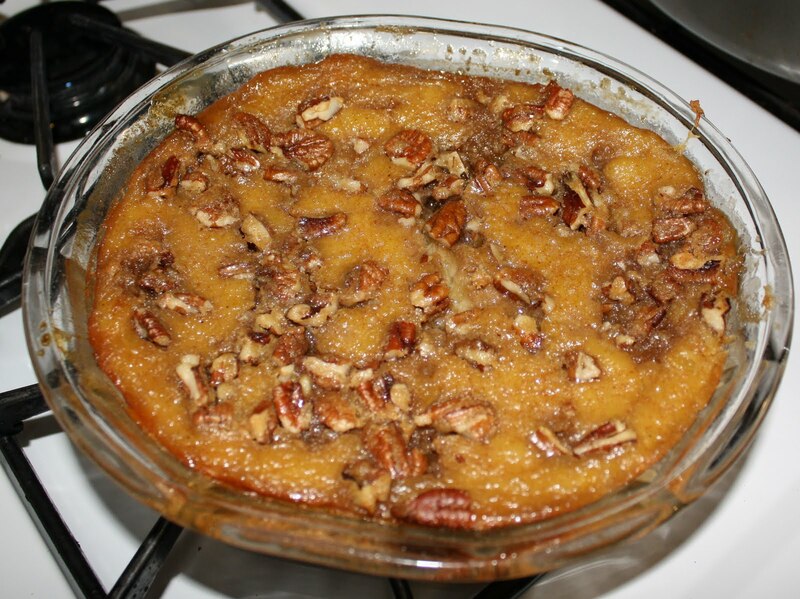 For topping, combine the brown sugar, pecans and butter. Sprinkle over custard. Bake 30-35 minutes longer or until a knife inserted near the center comes out clean. Serve warm or chilled; top with whipped cream and cinnamon if desired. Store in the refrigerator. Yield: 4 servings. This entry was posted in ducks, recipe by Achorn Farm. Bookmark the permalink.